Works with: iPhone SE, 6S, 7, 8, X, XS, XR; iPad Mini 4, 5; iPad Air 2, 3; iPad Pro Fortnite DOES NOT support: iPhone 5S, 6, 6 Plus; iPad Air, Mini 2, 3; iPod Touch Fortnite has come to mobile! Squad up and compete to be the last one standing in Battle Royale, or use your imagination to build your dream Fortnite in Creative. Requires an internet connection and iOS 11 or above. 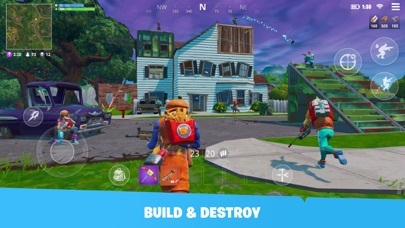 On mobile, Fortnite is the same game you know from PlayStation 4, Xbox One, PC, Mac, Switch. Same map, same gameplay, same weekly updates. Build your fort as you battle to be the last one standing. Jump in and squad up with friends around the world or in the same room! Powered by Unreal Engine 4. CREATIVE - Enter a universe of endless creative possibilities. Play games with your friends and explore countless community creations. Head to the Creative hub to check out new featured Islands every day. BUILD & DESTROY - Shape the battlefield by building your own cover. Opponent hiding behind a wall? Take out their cover to get the edge. GEAR UP - Board the battle bus and drop in on your favorite zone. Gather resources, collect gear, and battle your opponents! Last one standing wins. 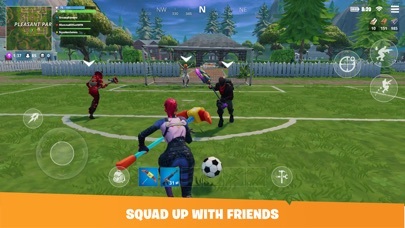 SQUAD UP WITH FRIENDS - Team up with your friends around the world or in the same room! 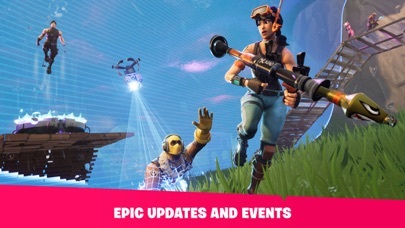 EPIC UPDATES & EVENTS - Weekly updates constantly fuel the fun. 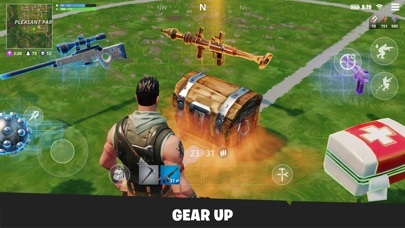 New gameplay modes, serious and insane new looks for your avatar, new weapons and items….Fortnite is always expanding. CONSOLE GAMING ON THE GO - Play the full game anytime, anywhere. Complete quests on the go, progress your Battle Pass, and more. So I get fortnite, a few months in 2018 to replay it. Then first round was ok, then later I was lagging after I got my first win...usually I get 10-87 ping but now I get 187-901 ping every second! All because of my dumb teen sister playing Netflix, which is what I thought, but no! I was wrong. It was the game lagging itself. So fix the goddamn ping or I am spam this company with complaints. Ok one quick question does it work on iPods or not bc you said it did but it doesn’t uhhhhh yea you got a problem going on or something pls tell me the truth but u probably won’t even reply sooo whatever but pls fix it! ?